The eye care professionals at 1 Hour EyeDocs specialize in understanding how the human eye really works, as well as diseases and conditions that affect your vision - many of which do not have obvious symptoms. Eye doctors know how age and risk factors affect vision over time for young and old, and they understand the benefits and features of corrective lenses including eyeglasses and contact lenses. 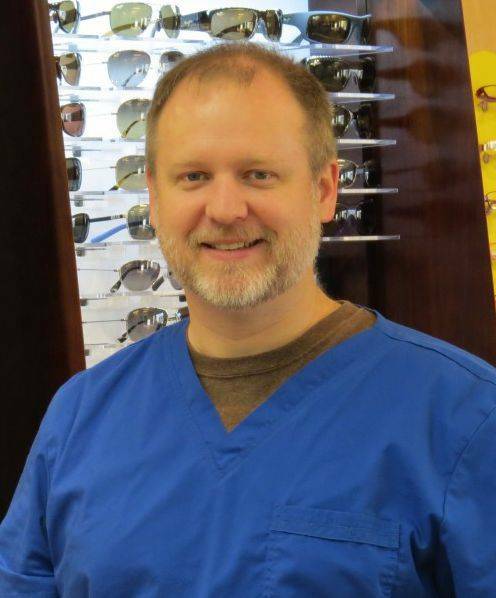 Dr. Buck Buchanan is no ordinary optometrist. While Dr. Buchanan’s father was in the army causing them to move around a lot when he was a child, he calls Laurel, Mississippi home. It was here he attended high school and the undergraduate part of his college experience. Career choices come to different people in different ways. As a child, Dr. Buchanan always loved science. In college, he got a job as an optical lab tech where he made the lenses and cut them out to put in eyeglasses. There were optometrists next door and he showed so much interest in their profession that they would pull Dr. Buchanan over when they were working on something really interesting. After graduating from University of Southern Mississippi (GO EAGLES! ), he went to pursue a career in optometry by attending the Southern College of Optometry in Memphis, Tennessee and has been in practice since 1998. While treating the entire family, Dr. Buchanan specializes in pediatrics and being ‘on the kids’ level.’ Children and teens actually enjoy coming to see Dr. Buchanan because they are very much a part of the process and leave the practice seeing better and looking great. He recalls one such student of about 10 or 11 years of age. Her parents had brought her to see Dr. Buchanan because her grades were slipping, she had really bad headaches, and her doctors couldn’t figure out what was going on. The eye exam showed she was very far sighted and it was easy enough to fix. She returned to the practice a couple of days later with the biggest smile on her face. Her parents reported that their daughter had put up a fuss in order to come back and tell Dr. Buchanan, ‘thank you’. What an awesome day. Little did Dr. Buchanan know that the patient was also a Girl Scout and the office has overflowed with Girl Scout Cookies ever since. Treating dry eyes is yet another specialty of Dr. Buchanan. In this case, bringing relief to people in pain and suffering from a very treatable eye condition. Dr. Buchanan does his job so well that in 2010 he was awarded “Doctor of the Year 2009”. When Dr. Buck is not treating patients, you will find him scuba diving, snorkelling, playing rugby, bicycling, exploring back roads, camping, computers, reading, and most of all spending time with his wife and three children.